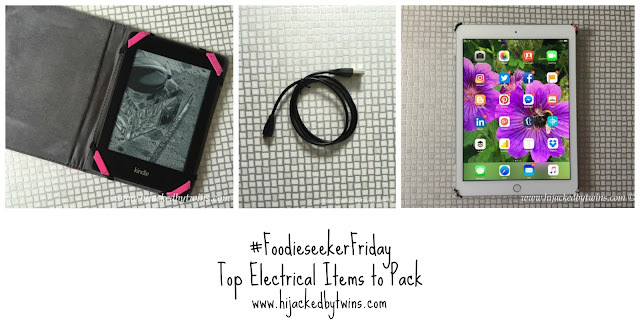 Hijacked By Twins: #FoodieseekerFriday - What To Pack! Now that we are getting closer and closer to our holiday my mind is constantly thinking about what we need to take with us. 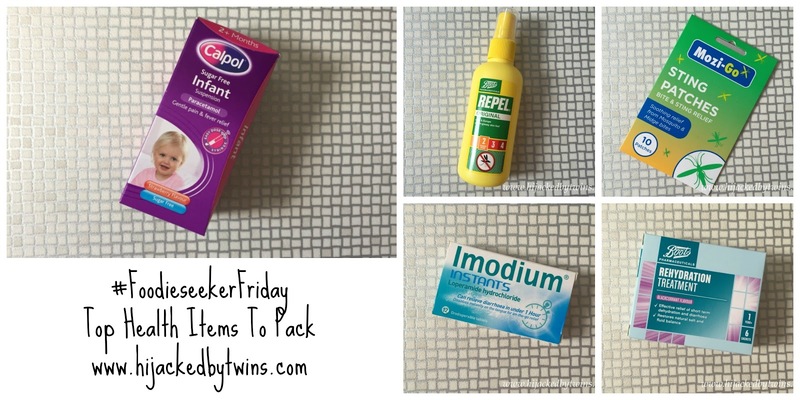 What I will need, what the hubby will need and what all three kids will need. What they will need to occupy them on the plane and what they will need on the ship. I will admit to getting stressed before we go on holiday. I am fine once we have left home but the build up to leaving can leave me quite stressed and anxious. So to help alleviate the stress I make lists for everything. Now we are really getting closer I have actually got items on my "things to buy" list ticked off at last. Clothes wise we are all sorted we just need to added extras. Games - I will be packing some games for us to play on the plane, in the evenings or just while chilling out. Bananagrams, cards and snap are on the list. Marmite - Yes, I will be packing Marmite! We have a little Marmite monster in our family. Little I will have it with everything so we need to have some to hand for her! Pocket sized squash - The twins do not drink fizzy drinks, they only have squash or water so I will be packing some of these super small, concentrated squash bottles to add to their water. Pencils and books - Colouring pencils are a must have for the kids as well as paper, colouring books and puzzle books. On to my favourite, poolside essential items! The list is quite short but very important! SwimFin - While we are on holiday we will be trying out SwimFins for the twins. They cannot swim yet and T is not very confident in the water so we are hoping that they will improve his confidence and allow little I to have a lot of fun in the water, she is a little water babe! Keep an eye out on update on how they get on with the SwimFins plus when we get home I will be writing a post to tell you what we think of them! Goggles - These are always the one thing that we forget so they are already packed. The goggles are for J who loves to be in the pool. I for one cannot wait to try out the water park slides with him! Sunhats - Sunhats will be needed all round for while we are sitting poolside. The weather should be gloriously hot so hats are a must have! Kindles - The three children will be taking their Kindle Fires, mainly for the journey and the hubby and I will be taking our Kindle Paperwhites as we are hoping for some time out to sit and read! Chargers - Chargers and adaptor plugs are top of the list! We have some adaptors ready and will be borrowing some from my dad too. iPads - The hubby and I will be taking our iPads for when we want to take a bit of time out and play on a game! Calpol and prescriptions - Good old Calpol works wonders! I will be getting some sachets to take with us as they are easier to pack and keep in my bag. Any prescription tablets will also be high priority! Mosquito repellent - We will be making sure we use mosquito repellent. Getting bitten is awful and we would hate for the kids to have those itchy spots! Sting patches - Just in case anyone does get bitten I have got some bite and sting relief! Imodium - Need I say more? Rehydration treatment - Just in case we need it! Last but certainly not least is sun care cream! Having 5 star protection is so important when using sun cream. Sun damage is caused by two types of ultraviolet light, UVA and UVB. UVA penetrates deeper into the skin and causes skin ageing while UVB causes the dreaded sunburn! All of Boots Soltan cream products are 5 star rated. They give the highest level of protection against the UVA rays. The SPF number is the level of protection that the cream gives against sunburn. Did you know that when a t-shirt is wet it offers no protection? So if you have sun burn and are swimming in a t-shirt, it offers zero protection! Also the effects of the sun is cumulative so if you burn in an area it will leave it more sensitive the following year! 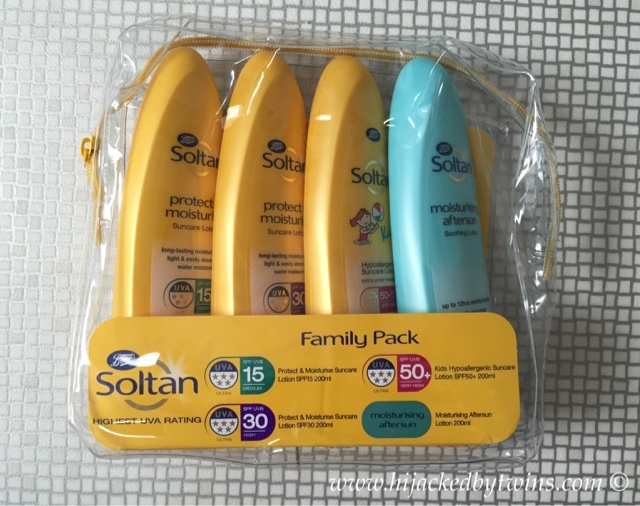 To keep our skin cared for and protected while away we will be taking Boots Soltan family pack of creams with us. This great, all in one, bundle ensures everyone is protected. It contains SPF 50+ for the children's delicate skin, SPF 30 and 15 for us adults and a soothing after sun lotion. Always check that the sun cream that you are using has the highest protection of 5 stars! So, apart from kids, hubby, passports, tickets and clothes do you think I have it all covered? Have I forgotten anything? If I have please let me know! You can also read how the four other Funseeking Families, Nadine Juggle Mum, Kara Chelsea Mamma, Laura Tired Mummy of Two and Sonia Mummy Constant are getting ready for the holiday! Disclosure: I am Carnival Cruise Lines Foodieseeker Blogger. I received the SwimFins for the twins and the Soltan Sun Creams to try on holiday. No cash payment was received. I think you've got it all! My dad always made sure I had a new puzzle book for any type of holiday so i'm happy to see them here! OMG you are far too prepared - need to get all our stuff together and fast! Have a fabulous holiday! 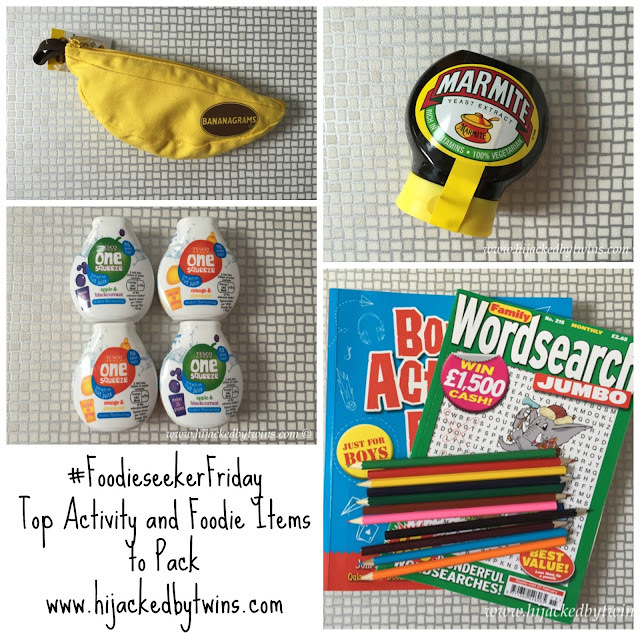 Great list - those little squash things are great for travelling arent they - I took one camping last week - so handy yet takes up practically no space! Whenever I go on holiday I always obsess over something to eat that I have back home. In Egypt it was hobnobs!